iPhone 5S is the fastest iPhone model of Apple, it was announced on Tuesday, September 10, at Apple's media event in Cupertino, California. The iPhone 5S has a speedier chip which brings up the computing power from 32 to 64 bits. 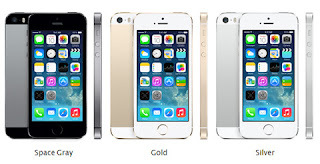 iPhone 5S has only 3 colors such as, space gray, gold and silver. Apple chief Tim Cook said, "It has over a billion transistors in it," then he added, "about twice as fast in graphics and computing power and about 40 times faster than the original iPhone." The rumored finger scanner for security purposes was also included in the iPhone 5S features, it's called Touch ID. If you're looking for cheaper model of iPhone, you can check out this new iPhone 5C . For the meantime, please kindly bookmark and visit this website regularly, like our Facebook page, follow us on Twitter, add us on Google+, and/or subscribe to our daily news feed via RSS or Email. Comments or suggestions about "Apple iPhone 5S, Faster iPhone model, Specs and Price" is important to us, you may share it by using the comment box below.